Only the two youngest (ages 5 and 6), joined in the craft time, which is as it should be. 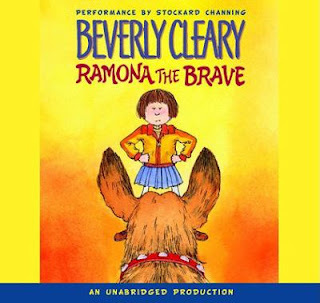 But, everyone made a cookie, and enjoyed listening to Stockard Channing's reading of Ramona the Brave by Beverly Cleary. You just can't make paper bag owls without Ramona...well...you can, but you shouldn't. And, since most of her stories start out, at the beginning of the school year, they're perfect for fall. As much as I enjoy reading Beverly Cleary stories out loud, I turned to an audio version this time, so I'd be free to join in the fun, and help the children with the craft, and cookies. I'm really fond of Stockard Channing's performance. But, it did make me smile to hear the children say, they like my reading better. It's always nice to have a fan club. You can find out what other families have been reading this week, and pick up some good recommendations, at the What My Child is Reading link-up hosted by Mouse Grows Mouse Learns. Does it get hard when your kids outgrow family traditions? It would seem like that might be hard to deal with. Ticia - New ones take the old ones place as time passes, so it's not too bad. I think the trick is to enjoy the warmth of the past, but keep looking forward. The cookies and craft are adorable. And a book was being read during? That makes it perfect! I'm an Aussie grandmother looking after a 6 year old and a 4 year old for 3 days a week. Your site has been an absolute godsend! I can't afford to buy many toys for them (and probably wouldn't, even if I had the money.) so your ideas for games and activities using everyday things have been a real inspiration. One of the best things has been that when they come over, their first question is usually "What are we going to make today?" Both the cookie and bag owls look so great! I love these cookies! Someday I have to make them. Thanks for the cute ideas. I didn't know about the Ramona audio series. I think I'll have to check it out. While we make some fall paper bag owls! Everything looks so picture perfect - both owl cookies and the paper bag owls. It looks like a great start of fall season to me!